When we say New Jersey, what comes to mind?… The Turnpike? Wawa’s? Bon Jovi and Bruce Springsteen? Well, with the help of Maureen Barrett, you can add Teen Science Cafés to that list! 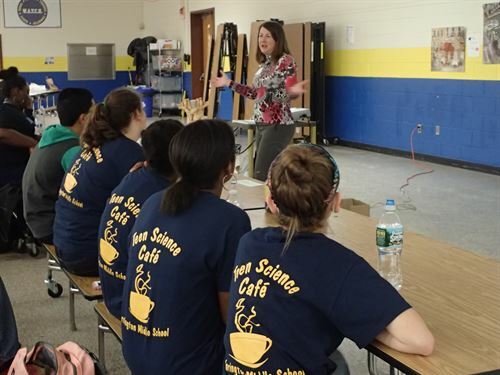 April 2016’s spotlight is on Maureen Barrett and the Harrington Middle School Teen Science Café. 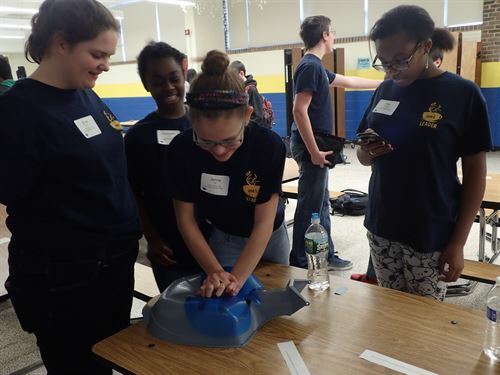 The HMS Teen Science Café learned how CPR can save lives. TSCN: To start off, please, tell us in a nutshell about your Teen Café program. What is special or unique about it? café provides them with the opportunity to do so. The students are given the chance to learn about a variety of STEM careers, from cardiology to the fundamentals of robotics. What’s interesting about the Teen Science Café events is that not only have the participants learned about STEM in the real world, they have learned to become leaders themselves. Our Teen Science Café leaders have been instrumental in making our café events a success! TSCN: Tell us a little about your background. How did you personally come to be involved with your Teen Café program? cited for the 2015-16 school year to start! TSCN: Your program has a home with Harrington Middle School, how do you see it fitting with their mission? MB: Fortunately, I don’t think we’ve hit a big stumbling block yet. We are keeping our fingers crossed! TSCN: What has been your favorite Café, and what made it so? MB: We have had three café events so far. I thought they were all great in their own way! MB: Sanjana is the Teen Leader Coordinator of our Teen Science Café program. Prior to our first meeting, we brainstormed committees for the students. Sanjana then came up with detailed responsibilities for each committee. At our first leader meeting, she discussed the responsibilities for each committee, and then the student leaders selected the committee that interested them. Throughout this first year, we continue to be impressed with how well the student leaders are doing their jobs. 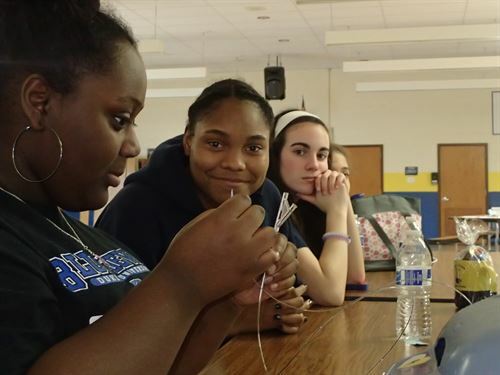 The third Core Design Principle of the Teen Science Café states that “Teens gain a sense of ownership of their program through opportunities of leadership.” This principal works! We are very proud of our Teen Science Café leaders! TSCN: Having just gone through the inception of a new Café, what advice do you have to those just starting their own Teen Cafés? MB: Just let go of the reins. The Teen Science Café leaders will not let you down! Thanks Maureen, we are looking forward to all the great things you’ll be doing with the Harrington Middle School Teen Science Café. You’ve made New Jersey proud!